If you are applying to attach banners, festive decorations or hanging baskets to street lights please follow the process on our dedicated pages. For all other attachments, including CCTV, Neighbourhood Watch signs and traffic survey cameras, please follow the process explained below. Before you make your stage 1 application to attach to street lights check you have . . .
3. A detailed specification of the proposed attachment. Please supply the weight, dimensions, proposed mounting height and fixing method. 4. An image or diagram of the proposed attachment and fixings. 6. 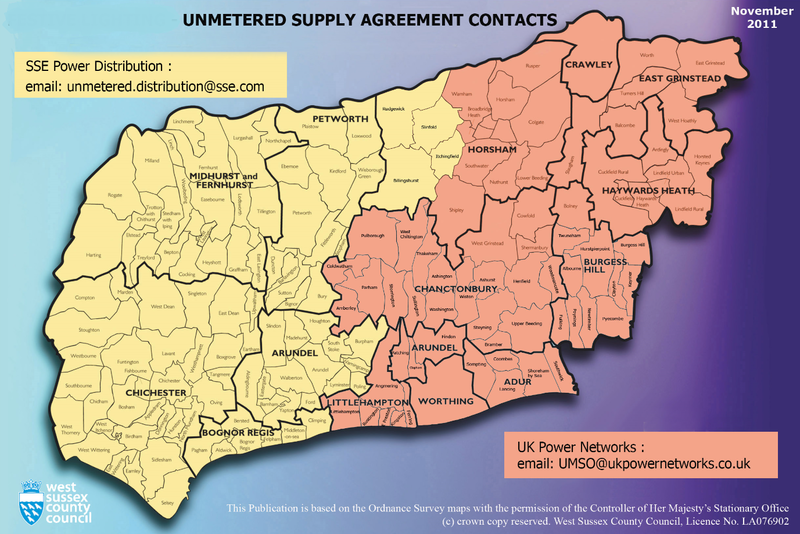 An Unmetered Supply Agreement? If your proposed attachment uses power from the street light you will need an unmetered supply agreement. This is an agreement between you and the power company supplying the energy to the streetlights. They will request the wattage of your attachment, amongst other information, so that they can calculate the amount of energy your attachment will be consuming over the network for the duration of its installation. In West Sussex there are two power distribution companies. Depending on the area you reside in this could be either SSE Power Distribution or UKPN. This map will show you which company you need to contact. You will need a new agreement each year you make an application. 7. Confirmation that the contractor installing your proposed attachment is HERS certified.